Some big (but expected) news today as the Lincoln Stars hired a new assistant coach to work under newly appointed head coach Jimmy McGroarty. Former Stars forward Mick Berge will assume the duties of assistant coach and director of scouting for Lincoln, effective immediately. Click here to read the press release that was posted earlier today on the Stars' website. Click here to read the press release from the NAHL's Minot Minotauros (the team Berge has coached for the last season). Berge played for the Stars from 2002-2005, and was a member of the Clark Cup championship team in 2003. After his USHL career, Berge went on to play four years of collegiate hockey for Minnesota State University-Mankato. Minotauros Assistant Coach Mick Berge, has accepted the Assistant Coach/Director of Scouting position with the Lincoln Stars of the United States Hockey League. Berge had started his second season on the Tauros’ bench at the NAHL Showcase last week. Now Berge heads to Lincoln for their season opener on Friday. Berge played in Lincoln for three seasons, amassing 35 goals and 82 assists. Berge was also quick to credit Head Coach Marty Murray with helping him advance; “Lincoln is an opportunity I can’t pass up. Having played there for three years I’m excited to go back to where my junior career began. Expounding on the information posted in each of the press releases linked above, Mick is originally from Okalahoma City, OK and played a few years of professional hockey after his four years at the University of Minnesota-Mankato. After his stint playing pro hockey, Mick was hired by the NAHL's Minot Minotauros before the 2012-13 season where he has been since now. Backtracking to his college years at Minnesota-Mankato, Mick was known at the time as a UND killer. He was a player that the Fighting Sioux of North Dakota had problems keeping in check. Click here to read more about that. Mick was an alternate captain at Mankato his junior season, and was named captain his senior season. As many know, Mick is the older brother of Josh Berge, who also played/coached for the Lincoln Stars. In the past week or so, I brought Mick's name up in conversation when talking about who Jimmy McGroarty and the Stars might hire. So when this news dropped today, I wan't surprised. 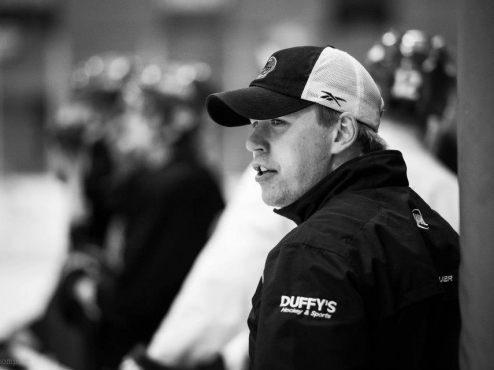 Mick is a familiar name and face, and has some good coaching experience in the NAHL. I'm sure he will be a great addition to the Stars' coaching staff. Click here to follow Mick Berge on Twitter. I'm going to embed a video below that Mick made when he was playing for the Allen Americans of the Central Hockey League (CHL). Welcome back to Lincoln, Mick!